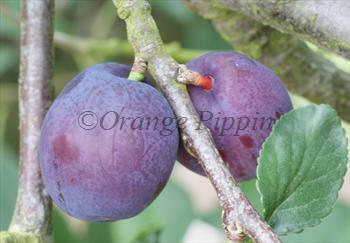 Herman is one of the earliest plums available, ripening in mid-July in southern England. It is medium size, with a blue-black colour, yellow flesh - similar to its parent, Czar, but with a better eating flavour, and ripening earlier. Herman is a free-stone plum - the stone falls away easily from the flesh. Please fill in the details below and we will let you know when Herman plum trees are back in stock. Herman is in flowering group 2. Herman is self-fertile and does not need a pollination partner, although fruiting may be improved if there is a compatible tree of a different variety nearby. Like Czar, Herman tolerates less than ideal growing conditions but if growing for dessert use then a sunnier aspect will help. It was developed to be cold-hardy. Herman was developed at the SLU Balsgard research station in southern Sweden in the 1970s, a cross between Czar and Ruth Gerstetter.